I've been beleaguered by wind for days and days here in central PA. Today was supposed to be better. Haven't had the boat out since last May so I hooked her up this AM and headed for the river. Oops!! Another bad weather prediction. Upriver wind and white caps...mmmm. Pulled the boat down the access area...left it on the trailer...fired up on the 4th flick of the key. Surprising!! After a almost a year...sitting hooked up to the gas line in the garage. I like my Yamaha. Ran the motor for about 10 minutes just sitting in the boat on the trailer at the access...then trailered her home. After lunch I went wading. The upriver wind had the shoreline looking like chocolate milk from all the wave action. 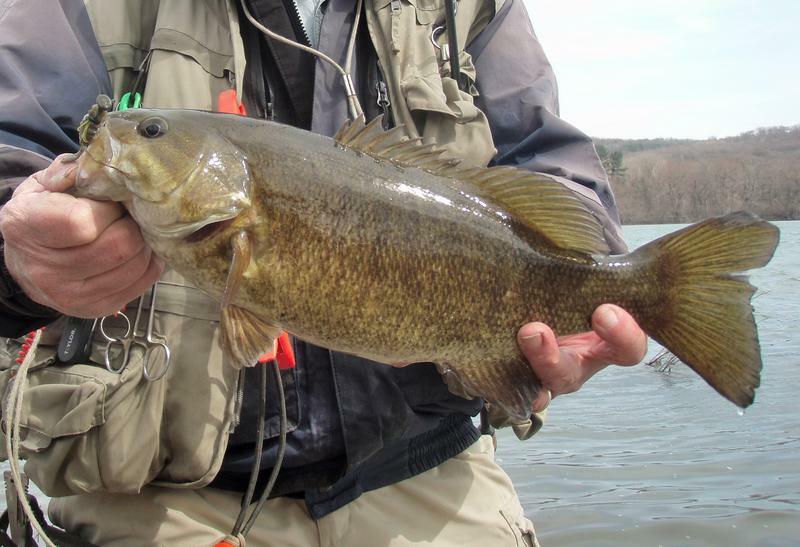 Nevertheless the water temp was 46F and I picked up 8 smallmouth. Most were cooker cutter 1-1.5 pounders with two just over 2 pounds thrown in. All we need is some stable weather and water levels and things will start to pop. Re: Almost got the boat out!! I keep my boat ready all year, it's in the garage and my truck sits outside. I swore after serving a tour in Vietnam as an infantry grunt I would never waddle in mud again. lol The mud on the launches is enough for me and I usually carry a snow shovel for that. My garage is too tight and not deep enough for me to put my boat and trailer, beside what would I do with all my ice fishing gear and camping stuff? So, it has to spend the cold winter all bundled up next to the garage on a gravel pad I had put in for it. yesterday I filled a big garbage can with water and tested the motor. It kicked over and ran on the first turn of the key. It probably would have kept running but I backed off the throttle before it had a chance to run a minute. Second try and it was off and running in its mini garbage can lake. I have a couple little things to tweak, a couple switches need to be replaced and the trolling motor has to be tested. The big job is as always fixing the two leaks in the weld on the bottom of the transom. This is the last year for that. Next year I'll be shopping for something newer with a jet. If I was a little younger I would spring for a new rig too. That JB weld is good stuff, two steps up from duct tape. Took me 65 years to afford a boat that didn't require a bail bucket so now I'm trying to wear it out before I am. Hope for a good river year, last year was a bummer! Your never too old for a boat upgrade.